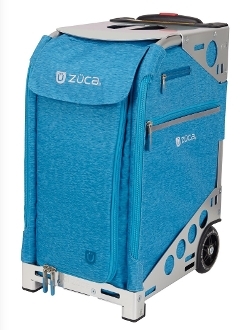 ZUCA Pro Travel Heather Aqua & Silver Carry-On Bag. You can easily fit between 6-7 days worth of clothing (depending on the season) into one of the best carry-on pieces of luggage you can own. Great for the professional, leisurely traveler or for kids who travel on competitive teams. Insert bag is also removable and hand washable. Packing Pouches sold separately. Travel Cover Not Included. Get the five removable packing pouches (color coded by size) and stack like drawers with the clear TSA compliant zipper pouch to make this the best travel/carry-on bag you own.